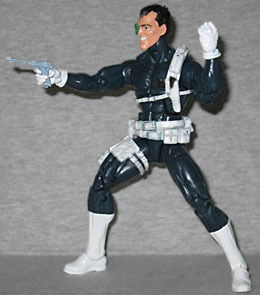 I just want to take a moment to point out that this is our third White Nick Fury figure, and yet we still don't have a single Darkhawk. When injustice demands action, SHIELD expert Nick Fury joins the charge against the bad guys. Whatever. Like Capwolf, this figure is more important for its variant head than for who it "really" is. 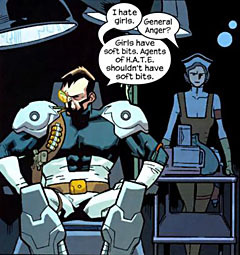 Dirk Anger comes to us from Nextwave: Agents of HATE. He was originally going to be Nick Fury until Marvel saw what Warren Ellis was planning to do with the character, so Ellis pulled a Watchmen and just created a "new" character. Instead of an eye patch, Dirk wears a cool translucent green viewfinder dealie. The sculpt is a perfect translation of Stuart Immonen's art, from the manic smile to his pseudo-fauxhawk. Guys, we have an official Nextwave toy! That's the best thing ever! Sadly, while the head is pure Dirk Anger, the rest of him is not. He's built on the small body, which is a perfectly cromulent choice for an agent, but this is clearly a SHIELD uniform - Dirk wore a completely different suit, one completely unlike this. Now we have a sad. It does look really nice as a SHIELD uniform, though. The body is dark blue, with white gloves and boots. Instead of giving him gloves that reach the elbows, like the last Nick Fury, Hasbro went all the way back to Bucky Cap to give us short gloves with a rolled cuff. 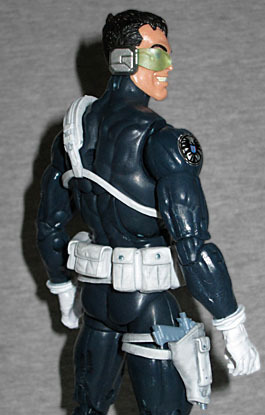 Since the standard SHIELD uniform is blue and white, the figure also gets a white shoulder holster with a molded gun, a double utility-belt, and a thigh holster that also has even more pouches on it. MORE POUCHES! Unlike the shoulder holster, this one works - he's got a gray pistol that fits in there. A silver and black SHIELD logo is tampographed on each shoulder. While the articulation is the same as on every other use of this body, the mold may be starting to show its age, because the neck is floppy, the chest hinge has big gaps on the sides, and the knees are a bit rubbery. So he may have all the same joints, but that doesn't mean they're all put together as well as usual. 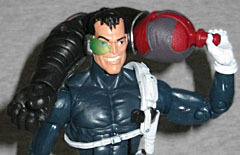 We already talked about the Dirk Anger head, so we should probably mention the Nick Fury one, as well. It's a lot better than the last effort, with a rugged face that sort of resembles a young Robert Wagner. He has painted stubble, like he should, and gray hair on his temples. He's not snarling any more, so no giving him a cigar. The original ML5 figure still has the best head, but this is a good second. And since it's entirely possible you already had two Nicks Fury in your collection already, this set includes a third head. 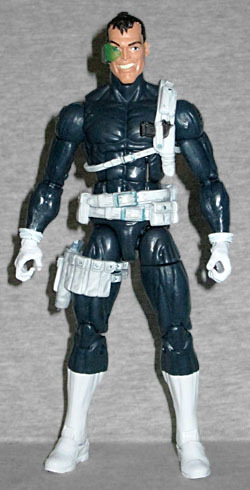 Rather than a generic face, like the previous figures offered, this one comes instead with a cool stormtrooper helmet. It has a blue helmet, golden visor, and a black mask with silver air filters. This will be great for army-builders! But it would be nice if at some point one of these generic SHIELD bodies included a black man with a white flat top and a goatee, so we could have a GW Bridge figure. Nick/Dirk/Cannon Fodder Trooper #527 comes with the left arm of this series' Build-A-Figure, Giant Man. It's be really exciting if Habro can ever get the rest of this series into stores, so we can buy the other BAF pieces and assemble the actual toy. Dare to dream! This toy would be a ton cooler if it were just a straight Dirk Anger, but the fans who don't already have one of the other Nick Fury toys will probably enjoy this one. And even if you do, the inclusion of the battle helmet to turn this into a scene-filler means it's a great offering no matter how big your collection is.